You don’t have to see a sturgeon in person to get a sense of just how monstrous and oddly majestic these ancient fish can be. But that’s exactly where Angela Köhler found herself a few years back–face to face with a giant, 30-year-old, 10-foot-long sturgeon that was being harvested for caviar. The marine biologist and eco-toxicologist was in Iran for a conference, and she joined a tour visiting a sturgeon farm and caviar facility at the edge of the Caspian Sea. “They brought in a huge female wild catch. They anesthetized it by a blow on the head, cut it open, and there were 7-8 kilos of caviar inside. They said, ‘this caviar is too mature to sell,’ so they discarded the whole fish, the caviar, everything,” Köhler recalls. 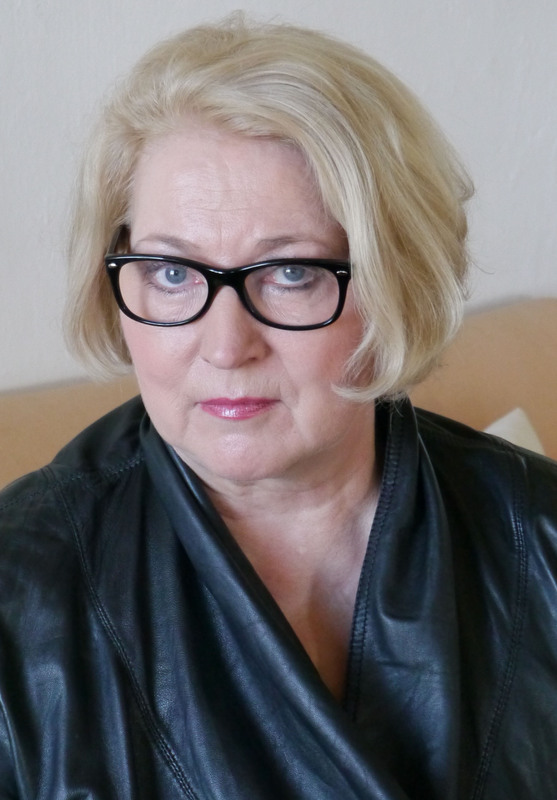 The move was especially shocking to Köhler, who spends her days thinking about the health of the ocean’s inhabitants. But she wasn’t alone in her concern. Despite various efforts to protect their stocks and stem illegal poaching over the last few decades, most of the 25 sturgeon species are critically endangered, or close to extinction. Declining habitat and pollution have played some role in this change, but rising global demand for caviar (and a new taste for it in China) is the main cause for their demise. You see, even if the caviar Köhler had seen harvested that day had been used and sold, the fish would still have died. All this got the scientist thinking: What if there was a way to stabilize mature eggs, and keep the sturgeon alive? After several years of experimentation, Köhler developed–and patented–just such a technique. She worked with Deborah Keane, owner of California Caviar Co., to use the technique in a contained sturgeon farm in Germany, where Köhler lives. The result is the first no-kill, or “cruelty-free” caviar. Like most caviar, this type, which the duo have branded Vivace, is still mighty pricey at $125 an ounce. But Keane believes that wider adoption of Köhler’s technique could begin to make caviar–the very symbol of inacessability–accessible to more of us. 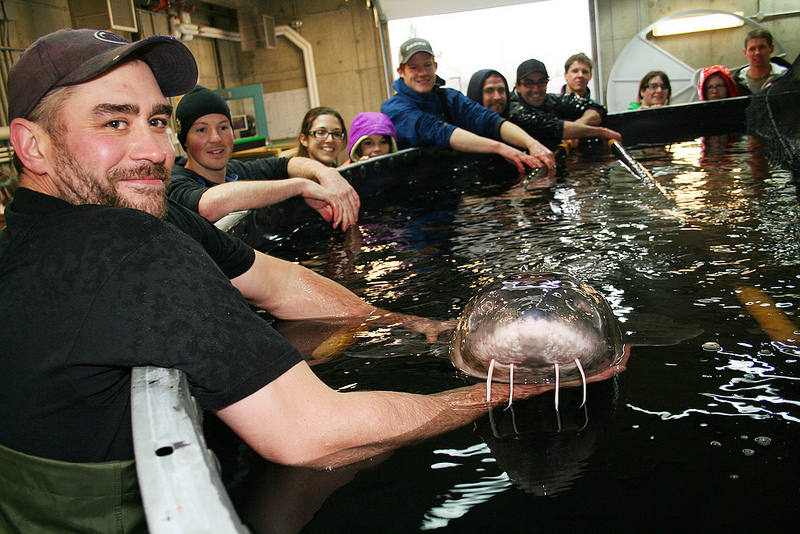 Here’s the thing: it takes Sturgeon farmers around a decade to raise a full-grown fish. Beyond the benefits to the fish, which will now be able to live out their 60-120 year lifespan, no-kill practices will also allow aquaculturists to harvest eggs from a fish every 1-2 years. That’s a significant difference, when you consider how many resources are required to raise (and feed) these fish. “It’s much more sustainable and affordable to have the fish continue to make eggs, versus just once,” says Keane. If she’s right, this unusual food might start gracing more plates–especially those of people who want to get the health benefits of fish but don’t believe in killing them for ethical reasons. Caviar is full of omega-3 fatty acids and acetylcholine (a neurotransmitter said to play an important role in memory retention). “It’s a very healthy food,” says Keane, who has plans to open a caviar tasting room in Sausalito, California this spring. And regardless of how you feel about caviar, that’s good news for the wild sturgeon, whose stocks are in desperate need of a rebound. Photo at the top by Vancouver Island University. Photos of Angela Köhler and the Vivace facility courtesy of California Caviar Company. What about the issue farm raised fish being fed antibiotics and living in crowded, confined areas where they aren't able to experience normal behaviors? Aside from preserving the life of the fish it's profitable to the farmer... But these fish are huge and live a long time. Seems unfair to live that long in such an environment. I am assuming the fish must be still be anesthetized. Do you still use a "blow to the head"? Also, I am envisioning a sturgeon on the operating table and the trauma of surgery. Better still, the trauma of surgery every 1-2 years! The article above does not go into specifics, but I wonder what it must be like for the fish. I cannot get the images of an "abortion" or a "C-Section" out of my head. What exactly is the process and is it really more "humane"? Read comments by Shannon and Rich. Do you have to pick apart what appears to be a very positive development in the caviar industry? All farmers employ Veterinarians who look after the welfare of the fish. They are qualified medical doctors who prescribe antibiotics ONLY when needed (like your doctor). As for the anesthetic question ....... Let's put it this way; if you wanted to survive an operation, would you allow your doctor to put you to sleep using a blow to the head? OMG. What Ms Kohler forgets to say is that biologically, in order to induce ovulation in sturgeon females they have to inject a hormone ( which Ms Kohler calls: maturation inducing cocktail... still a hormone or worse mix of hormones)... Who wants hormones in their caviar - in any food for this matter? Moreover, the ovulated eggs taste very different than real caviar! I believe it is nothing wrong in growing or harvesting a fish and using it all, naturally, nose to tail, caviar, meat and all the by-products! Why going against God's way? It is really for saving sturgeon or for money? Think for yourself, those are aquaculture fish we are talking about! Our sturgeons (siberian and russian) are very healthy creatures which rarely suffer from infectious diseases. The have a very well-developed immune system because of their long evolutionary history. Vivace keeps sturgeons at 40 kg per m³, which is only 10 to 20% of the density that you find in aquaculture for carps, salmons, catfish etc. The sturgeons are not fed for rapid growth and rapid harvest as usual in aquaculture, but for health, because they should live for many years. They are kept not only in the indoor facilities but also in outside ponds under natural conditions. Stripping sturgeons is a commonly used method for propagation. 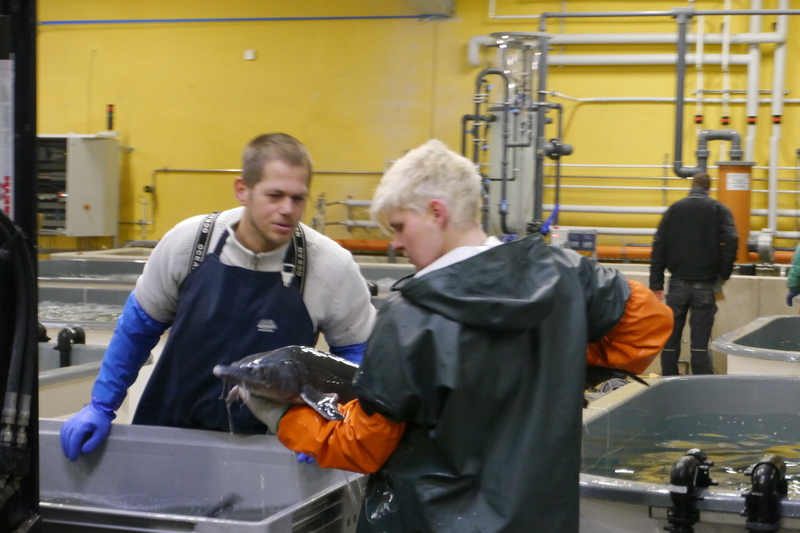 The procedure is the same as in any other farm that produces young fish. Sturgeons in the Vivace facilities are not anesthetized because it would be too risky for the fish not to wake up again. They don’t need to be anesthetized, because they don’t suffer any pain. Eggs are carefully stripped off the fish by a gentle massage while the fish is lying on a table with water flowing over the gills. There is no caesarian section because (1) it is not permitted and (2) most of the fish would not survive such an intervention. Vivace’s fish arecontinuously looked after by veterinarians from the University for Veterinary Medicine in Hannover, Germany. There is no need for the application of antibiotics in the pools (see comment to Shannon). Like every farmer that propagates fish in order to produce offspring, Vivace uses an agent that works in the brain of the fish and increases the level of magnesium in the blood. Increase in magnesium induces the contraction of the cells that are surrounding the eggs, so that they are released into the body cavity. The “hormone” itself, which is in fact a neuronal peptide, applied 24 hours before spawning, is degraded within minutes in the liver and the kidneys. Mature eggs are a closed systems - in contrast to the immature eggs that are used for conventional caviar production. They have no receptors and cannot take up any substances from the blood except calcium. Therefore, there are no hormones getting into or accumulating in ovulated stripped eggs. Mr Ceapa should explain the situation in conventional caviar where the still maturating eggs have all their receptors for hormones. And yes, caviar from stripped eggs taste very differently: they lack the fishy smell and rancid taste from degrading blood vessels and follicle cells. Their taste is pure and fresh with marine flavor. This result can only be achieved by keeping the fish alive. With all due respect, I am sorry but mixed with good scientific information there is lots of misinformation in some of the messages above. 1. "Vivace keeps sturgeons at 40 kg per m³, which is only 10 to 20% of the density that you find in aquaculture for carps, salmons, catfish etc." - Not real - would mean that densities mentioned would be 200-400 kg/m3! 40 kg or around is regular density for sturgeon aquaculture, while yes, some other species may go higher, around 100-150 kg/m3! 2. "There is no caesarian section because (1) it is not permitted and (2) most of the fish would not survive such an intervention." - Not real - C-sections for sturgeon spawning are permitted and routinely used in aquaculture! I personally do it for 20-30 sturgeon/year and I never lost one single fish, they recover well, I have females shortnose with 4 C-sections each, nice and healthy! But we do not use them for caviar or meat production! Russians are using a different method (cutting the oviduct) which probably is also used for this "gentle stripping" you mention, because other way would take hours to get the eggs out! 3. Every farmer (including myself) use either artificial hormones (LHRH etc) or a natural hormone mix - hypophysis (pituitary gland) for spawning sturgeon or other species, not an "agent"! Although it may be, as you say, degraded, maybe undetectable in the fertilized eggs (to check! ), it should be declared to consumers as it is - a hormone used to induce ovulation! 4. "fishy smell and rancid taste from degrading blood vessels and follicle cells." - Anybody who tried real caviar knows that caviar never should taste fishy or rancid! If you tasted such caviar then either is not real or was kept for days out in the sun! I understand that this method is used and probably approved by authorities in Germany and other countries, I just do not want the public to be misinformed! Nothing else to say! How can I, as a new aquaponicalist, if such a word exists. Find out more about the 'No kill method of Caviar harvesting? Also could you please advise me as to whether or not, Sturgeon can be kept in well oxygenated warm water, with let's, say 'Tilapia'.